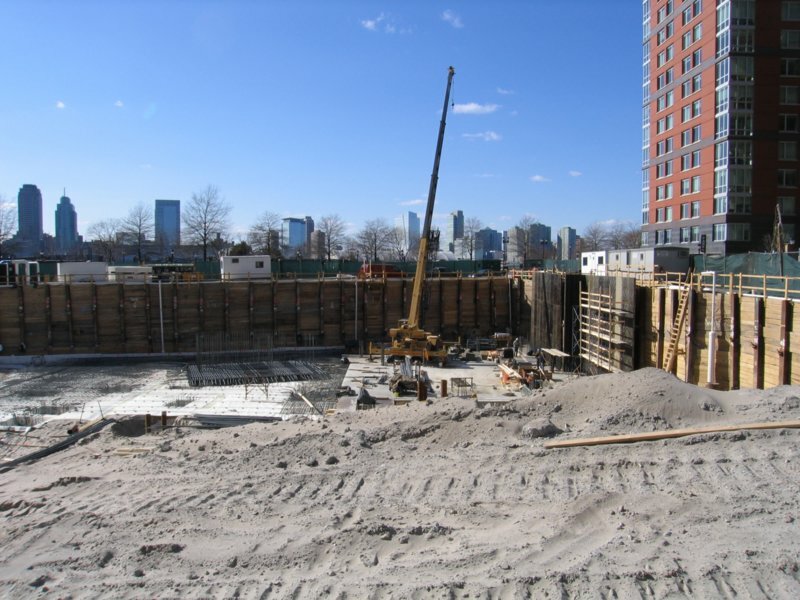 A large "green" condominium apartment tower is under construction in the north end of Battery Park City, just to the north of the World Financial Center. 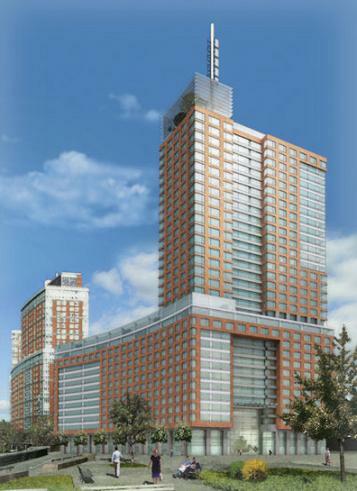 Known as 1 River Terrace, it being developed by the Sheldrake Organization and will be a 32-story, 320-unit condominium apartment building on a site bounded by Murray and Vesey Streets and North End Avenue. The building, which will have a curved base facing the Hudson River, like some of the buildings on Riverside Drive, will house the first public library at Battery Park City. Designed by Polshek Partnership LLC, the building is configured in a U-shape with a 14-story west wing facing the river, a 13-story east wing facing Lower Manhattan and a 32-story facing south. The wings will have landscaped roof gardens and the tower will have a 4-story-high, glass-enclosed portico/lobby. The "green" building will have filtered air and water, non-emitting carpets and paints, and triple-layered windows, many of which are at the tower's corners. It will also have a health club, a children's playroom, a bicycle storage room, a garage, a doorman and a concierge and a cold-storage room for perishable items. Ismael Leyva Architects P.C., is designing the apartments. The handsome red-brick building is located between the Irish Hunger Memorial and the two-acre Teardrop Park. Last edited by krulltime; February 23rd, 2007 at 02:27 PM. The “green” building will have filtered air and water, non-emitting carpets and paints, and triple-layered windows, many of which are at the tower’s corners. It will also have a health club, a children’s playroom, a bicycle storage room, a garage, a doorman and a concierge and a cold-storage room for perishable items. Ismael Leyva Architects P.C., is designing the apartments. The concrete "bath tub" for this one is now complete ... should start rising soon. Does anyone have the pricing information? Please contact me. Thanks! Last edited by krulltime; November 9th, 2006 at 03:39 PM. The scale is overwhelming, and it has nothing to do with height. Too many windows repeated in Hitlerian regimentation, too little variation, and what variation exists comes as contrasting areas that are too large. Urbanistically, this building stinks. I find it particularly odd as that corner at the center of the rendering has clear views out to the harbor (it overlooks the Irish Hunger Memorial and thereby has no obstruction whatsoever). Why did they choose to design that part of the building in the monolithic brick / window configuration? The corner should have been wrapped with glass. ^Probably trying (too hard) to be contextual with most of the newer BPC residentials. While I've never had a problem with the prevailing style of the architecture there, it is starting to look a little monolithic. Maybe Goldman's tower will break it up a bit. Nothing wrong with a little diversity. Here is a very different rendering found on the marketing page for The Sunshine Group. The effect here reminds me of 101 Warren St. Situated where Manhattan’s best kept secret, Rockefeller Park, meets the Hudson River, Riverhouse is a place that marries neo-green design by Polshek Partnership Architects in collaboration with Ismael Leyva Architects with the fun and fantastical elements of David Rockwell design. 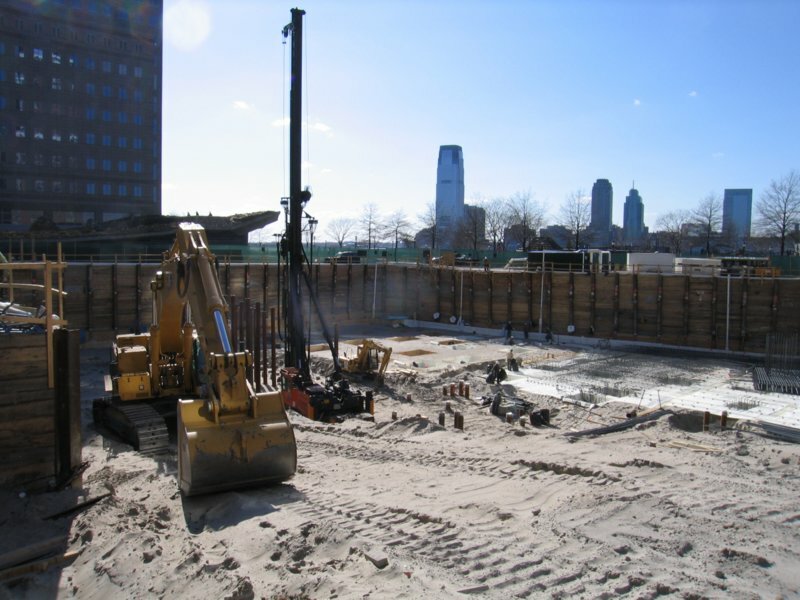 Riverhouse utilizes environmentally responsible materials, green roofs, and state of the art air and water filtration and recycling technologies in delivering the highest-performance green living standards ever offered in condominium housing in Manhattan. Meaningful amenities and apartment finish details are designed by Rockwell to foster fun and encourage healthfulness. Rockwell integrates Oxygen Green™ into the design of the oversized fish tank in the double-height lobby (with treehouse above), the children’s lighthouse, the billiard room, gym and yoga room – even the glass-tiled, 50’ swimming pool. Additional building features will include on-site parking, bike room, and landscaped roof terrace. A new branch of New York Public Library and City Bakery (organic) will also be on site. Situated on the last and arguably the best waterfront site in Battery Park City, Riverhouse will enjoy a view over Rockefeller Park and New York Harbor toward the Statue of Liberty and Ellis Island. With 264 one, two, three, and four bedroom condominium residences, ranging from 822 to over 2590 square feet, and starting priced from approximately $800,000, Riverhouse offers a diversity of living styles, including simplex, floor-through, duplex, and many penthouse layouts; over 80 percent of the residences will enjoy river views. Last edited by kurokevin; August 30th, 2006 at 03:17 PM. LOL -- that rendering makes it look like it's a lone building out in the country.